I've been doing a bit of research on the hat worn by Bonehead in Beach Blanket Bingo (and apparently other Beach Party movies). The R.F. 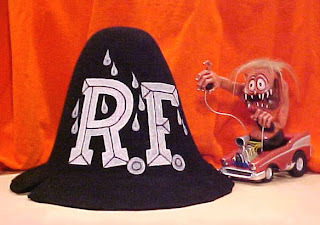 stands for Rat Fink - a character created by artist and custom car creator, Ed 'Big Daddy' Roth. Rat Fink was the 'anti-mouse' to Disney's Mickey Mouse who Ed Roth apparently hated with a passion. The hat, which Roth dubbed a 'Hillbilly Crash Helmet', apparently became a bit of a surfing and hot-rodding icon. I discovered most of this information from the docmentary Tales of the Rat Fink which gives the background and history of Hot Rod culture and Ed Roth's part in it. The documentary also credits Ed Roth with inventing 'the tshirt with a message' when he began drawing some of his monsters on tshirts. Some of these can be seen in the surfer movies such as the Surfink tshirt Bonehead wears (seen below). You can buy some of these designs from the Big Daddy Roth site. Didn't he or someone like him come out with a whole line of trading cards that featured these characters on them? Seems to me I still have one of those. Ed Big Daddy Roth is pretty much one of my heroes! He is a crazy character who came up with some brilliant ideas! He pinstriped, built wild custom fiberglass hot rods & trikes and had a ton of merchandise from crazy monster t-shirts to models of his cars and whatnot. When on the road, he would sleep next to his car, which was parked on the side of a highway...no hotels. Definitely an original! There was a lot of merchandise surrounding Ed Roth's art and custom cars. I'd hold on to those stickers/cards if I were you 1950s... or better yet, send 'em to me! Amber - have you seen that documentary 'Tales of the Rat Fink'? I found it really interesting. I knew nothing about him until yesterday and now I know all that stuff from the documentary and a few websites. Not surprised he's a hero of yours. He seemed to be a pretty cool character. Wow something I've always been fascinated about. Thanks for the documentary pick.